Ideal for first time buyer or those looking to downsize. The home is spacious and bright, briefly consist of entrance hallway, modernised kitchen with integrated appliances, the lounge overlooks the rear garden. On the upper floor is 2 well-appointed bedrooms, dressing room with fitted wardrobes and bathroom. 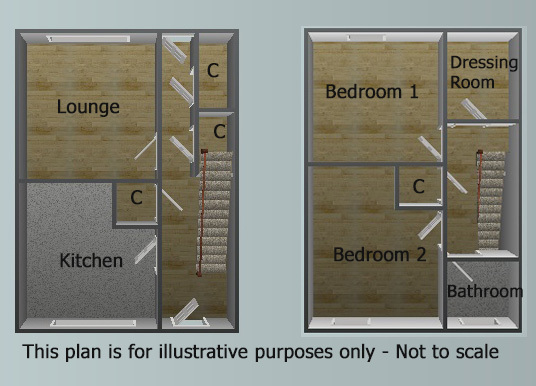 The home benefits from gas central heating, double glazing and storage cupboards on both the ground and upper floors. There are low maintanence gardens to the front and rear of the property. The property is located within the popular location of Park Mains and is within walking distance to the local schools and shops. Located on the first floor is this one bedroom modern apartment located in the popular Dargavel Village, Bishopton. The apartment was built in 2017 and is perfect for commuters as within walking distance to Bishopton train station and the M8 motorway. Bishopton offers a range of local grocer shops, post office, places to eat and so much more. If you are looking for high street stores Braehead shopping centre is only a short drive away. Briefly this bright spacious falt which is neutrally decorated theroughout has large lounge, large double bedroom with built in storage, kithcen and bathroom This is an opportunity not to be missed and viewing is highly recommended. You can now arrange your viewings 24 hours a day directly through New Door's website and clicking on your preferred time.